You’ve heard it a million times, but hear it once again – adding plants to your home is the easiest way to make it look good! Whether you’re going for the spa-like bathroom or the Instagram-worthy bedroom look, a plant is a thing that adds a classy, finishing touch to any makeover project. But not everyone has a green thumb. Fret not – we picked five of the most low-maintenance plants available in India that you can add to your humble abode. We’ve also shared the best spots in the house to place them. Money plants, or Pothos as they are scientifically called, are not only easy to introduce in your home but also fairly easy to maintain. You could either go the conventional way of growing them in a pot of soil or simply sprout them directly in a vase of water. Where To Add Them To Your Home: Wind the vines of the plant around the railings of your staircase or windows to serve as a means of decor. Another way for you to make use of money plants is to leave them in a pretty vase of water at the centre of your coffee/dining table. LBB recommends: Masjid Nursery and these five websites. Succulents such as Aloe Vera and Jade can also be introduced indoors. In terms of maintenance, they require none. In fact, even if you happen to forget about them, they’re going to be alright! Both Jade and Aloe Vera plants live on for years together with minimal requirements of water and sunlight, as they are succulents in nature. Where To Add Them To Your Home: Place them in your study, or perhaps in the sitting area by the side of the sofa to add to the aesthetics of your home. LBB recommends: Project Co and Nursery Live. Some plant species such as Jasmine, come packed with the ability to absorb odours, purifying the air in the process. They require cool temperatures, so placing them in a well-lit room should do the trick for you if direct sunshine is not at your disposal. The plant does require a good deal of water, as they strive particularly in moist soils – so be sure to provide an adequate amount. Where To Add Them To Your Home: The kitchen stirs up quite the appetite but before it gets to that aromatic phase of luring passers-by in, it coughs up some not-so-nice aromas too. So, you could place Jasmine plants in the kitchen to freshen up the air a bit. LBB recommends: Nisha Nursery and Amazon. Simple vines and shrubs can be used in their fresh or dried states, both adding a unique touch to the areas where they are placed. Ivy is one of the best vines that you can house indoors as it adapts to varied light conditions. This means that you can place it in a room that receives a lesser amount of sunshine, or one that receives a great deal of it. Where To Add Them To Your Home: Place it in a corner of your crockery unit, or simply at the edge of a high reaching shelf. It bunches up at the top and flows towards the bottom beautifully. LBB recommends: Nursery Live and Nurturing Green. Spider plants generally grow in tight quarters, so a small pot should suffice to hold them. In general, these plants are low maintenance and undemanding, fairly easy to introduce into any environment as they blend right in. Fertilization can be done as little as two times a month for these plants to survive. 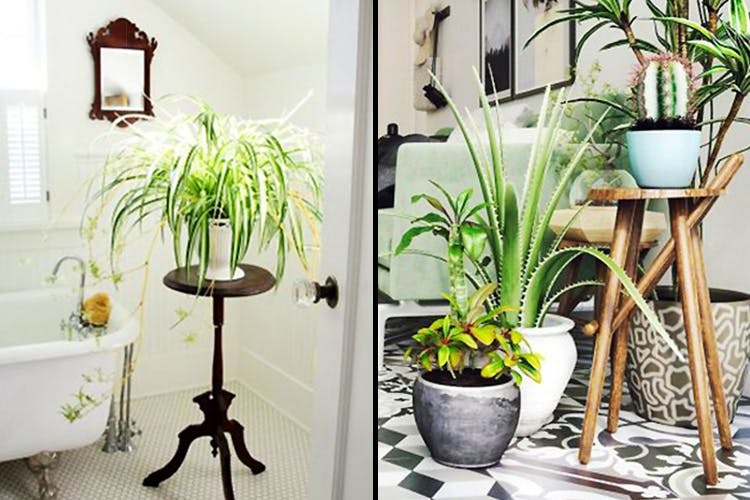 Where To Add Them To Your Home: As Spider plants can withstand the humidity of the bathroom, you can place them just about anywhere: from the window sill to the wash basin, there is no dearth in terms of areas where you can introduce them. LBB recommends: Green Decor and Lawnkart.